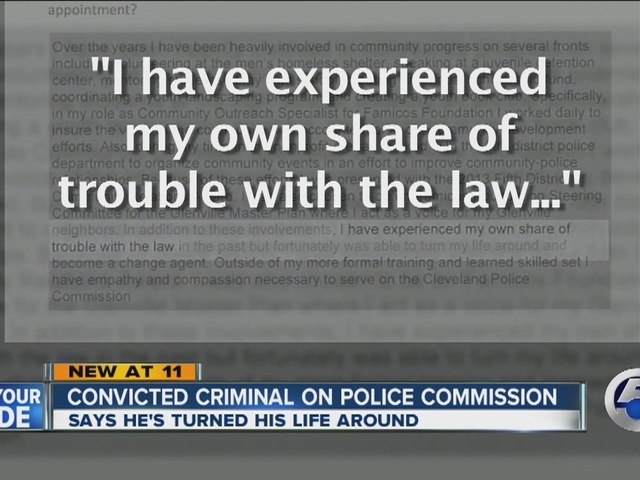 One of the members picked to oversee changes to Cleveland's police force is no stranger to the law -- he's a convicted criminal. Anthony Body, 28, is one of the newest members of the Community Police Commission sworn in on Tuesday. He joins a dozen other volunteers who will work to recommend changes to police policy, as part of the city's deal with the Justice Department. The commission is made up of preachers, teachers, doctors, lawyers, police and a politician. But newsnet5.com discovered that Body has a criminal record dating back to 2008, including convictions for carrying a concealed weapon and aggravated theft -- felonies pleaded down to misdemeanors. "I made a few mistakes when I was young, but I'm moving forward now," Body said. "People change, people grow." Body openly discussed his past on his application for the commission, so we asked Colleen Cotter - a member of the selection panel - why out of nearly 200 applicants someone with a criminal record was chosen. "I would not describe someone who has a criminal record as a criminal," Cotter said. "Someone who has a criminal record in their past is someone who has re-entered the community and people who re-enter the community and turn their lives around, are engaged in the community, are focusing their life on making the community better, good for them. We should reward that and include those folks, not exclude them because they made a mistake." After being in trouble with the law, Body eventually went to college and currently works as a goodwill ambassador doing outreach for the Northeast Ohio Regional Sewer District. He is also working towards his Master's degree. "Those criminal experiences allow me to bring a sort of different perspective to the commission and bring an added value in a sense," he said. The members are unpaid and will serve four-year stints. This is the second time questions have been raised about the police commission. Pastor Jimmy Gates stepped down from his role on the selection panel after his past record was brought to light.